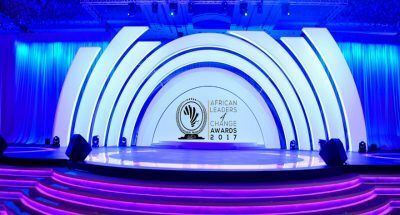 Johannesburg—September 21—It was a star studded night at Sandton’s L’Opulence last night as the Africa Leaders 4 Change Awards (ALCA) hosted a listening session to their theme song. The song features a mix of rich African talent such as Akon, Yvonne Chaka Chaka, Jah Prayzah, Peter Square, Fally Ipupa, Danno Peterson, Themba Mhinga and many more. The event, hosted by South Africa’s darling, Nonhle Thema was full of surprises. Zimbabwe’s Jah Prayzah, sang part of the song live, on stage, to a dancing crowd. He also sang his most famous hit “Mdhara vachauya” bringing the entire room of about 60 guests to their feet. “I am so excited to see Jah Prayzah here. He is one of Africa’s most rising stars. With his magical voice, I want to take him to the world because everyone must know his music,” said music producer Hakim Abdulsamad, who also shared a song on stage. Hakim, one of Akon’s top producers, also wrote and produced “The Song for Africa” which united the crowd yesterday. “The challenge was to try and fit all the great voices together, making sure people go into studio and record and then mixing and mastering the song but when working with artists as these, it can only be great,” said Hakim. The event was also attended by multi-talented music producer and entrepreneur, Mbacke Dioum, Ntsiki Mazwai and Chi Mhende. Themba Mhinga, Johnross Jamela Vuma, Jared Joshua Fray, Danno Peterson also entertained the guest with life performances. The song will be officially released and performed for the first time at the ALCA award ceremony on November 21. Those who attended the event were also surprised with free tickets to attend the show. The ALCA Award ceremony will honour and recognise initiatives making a breath-taking difference and adding a positive meaningful impact in and around the African continent without any financial reward. “There is a lot of good work being done by Africans for Africa and our hope is not only to celebrate those who are . . . Global Open Data for Agriculture & Nutrition (GODAN) Executive Director André Laperrière praises the formation of the first ever ministerial network, specifically focusing on open data for agriculture and nutrition and Africa’s leadership in hosting the discussions, coincidentally the continent with the largest untapped Agriculture potential. 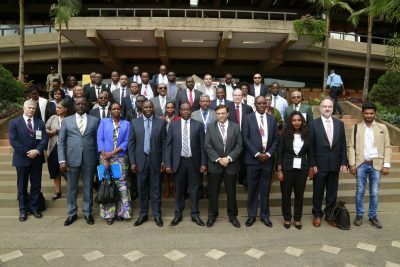 GODAN’s André Laperrière issues challenge to all to meet the success of the discourse on innovation and opening data at the Ministerial Conference on Global Open Data for Agriculture & Nutrition which took place between 14th - 15th June at the Kenyatta International Convention Centre. 15th June 2017, LONDON: The Global Open Data for Agriculture & Nutrition (GODAN) initiative together with the Government of Kenya and 15 African Ministers including from South Africa, Congo, Sudan, Kenya, Uganda, Sierra Leone, Rwanda and Ghana, have agreed to a declaration for comprehensive open data collaboration in the nutrition and agriculture sectors, to combat the global food security crisis. The declaration is historic in that it presents the first time a ministerial level network, focusing on open data for agriculture and nutrition, has been formed. Coincidentally the Conference takes place in Africa, the continent with the largest untapped agriculture potential, proving a major milestone towards achieving global food security worldwide. The declaration was agreed at the Ministerial Conference on Global Open Data for Agriculture and Nutrition on its closing day, part of the 4th Agritec Africa Exhibition which takes place between 14-16th June at the Kenyatta International Convention Centre. Hosted by the Government of Kenya, GODAN and Radeecal Communications, the conference is touted as the largest worldwide event to convene business leaders, governments from several G77 nations and at large the Global South, for the singular and unified cause of technologically and scientifically revolutionising agriculture through . . .
13th June 2017, LONDON: The Global Open Data for Agriculture & Nutrition (GODAN) initiative, launched in 2013 and led by the UK and US governments to propagate for open data in agriculture and nutrition to scientifically combat world hunger and food security, is the co-host of the Ministerial Conference on Global Open Data for Agriculture and Nutrition and 4th Agritec Africa Exhibition, with the Government of Kenya and Radeecal Communications, taking place on 14th – 16th June at the Kenyatta International Conference Centre, Nairobi, Kenya. Touted as the largest worldwide event to convene business leaders, governments from several G77 nations and at large the Global South, for the singular and unified cause of technologically and scientifically revolutionising agriculture through sharing of vital data which are currently hidden or inaccessible, the Conference will be attended by 1,000 high level participants, led by Ministers for Agriculture from 100 countries, private sector, academia, think-tanks, civil society, youth organisations, research networks and development practitioners, the United Nations and multilateral institutions especially the African Development Bank (AfDB), UN Economic Commissions for Africa, Asia and Latin America, the African Union Commission, Africa’s Regional Economic Communities (RECs) and international organisations. Kenya is a fitting host for the conference, representing Africa, which as a continent has huge potential for Agricultural growth due to its abundance of Land and Water Resource. In Africa, the Agriculture sector employs 65% of the labour force with the sector accounting for 32% of Africa’s total GDP. Yet, land and agricultural productivity are found to be one of the lowest in the world. The economy of Kenya is the largest by GDP in East and Central Africa with the agriculture sector contributing 24% in the total GDP of Kenya in year 2011. Periods of high economic growth rates have been synonymous with increased . . .